Hi folks, it looks like I have accidentally decluttered 365lessthings today. I spent so much time answering comments yesterday that I didn’t realise that I hadn’t written a post. I woke up just before the alarm this morning and it suddenly occurred to me I had forgotten. I must apologize. Unfortunately we have a federal election here in Australia today so I have to go vote (it’s compulsory here) before work so I don’t have time to throw something together. I promise I will be back tomorrow. 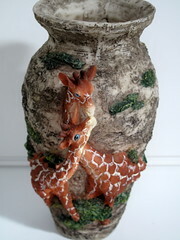 Thsi vase was a gift for my mother (She loves giraffes) but it is so fragile that I have always had some excuse never to get it to her. I may give up on the idea and donate it, it’s a bit gaudy anyway. It has been in my possession for at least five years. That brings this weeks year tally to 69.5. I appreciate that and I am glad you are thinking of yourself as being part of a community. That is what I consider 365lessthing to be. No problem. Just consider it an election day pass. I had been so organised on Wednesday, Thursday and Friday too. Actually it was very furtunate that I was because I was as sick as a dog for two days so it was lucky today’s post was the only one missed. Consider me one of the “we”, also. Voting is compulsory there? How do they enforce that?!!! I am glad you are a we! To answer the “how do they enforce compulsory voting.” They fine you if you don’t. I don’t now how big the fine is as I have never not turned up and it must be a job and a half to compile the list of people who didn’t show but that is what they do. Thank you for the answer to my question. I hear the vote results were interesting! Hope you are recovering quickly. thanks for that. I am getting there. Wow – I think it’s great to make the voting compulsory–our turnout is dismal also in the US- esp for local positions. at least we know we have a full count of the entire adult population’s choice. Although this time it hasn’t given us a clear result.